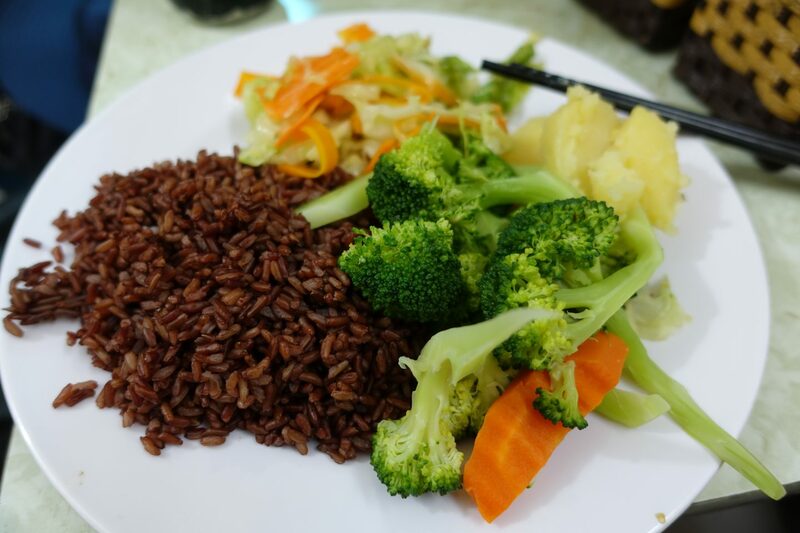 To my surprise, finding affordable vegan food in Hanoi was rather difficult. While there are affordable places on Happy Cow, most of them are expensive. I had such great food in Ho Chi Minh City and was so looking forward to my stay in Hanoi. I always strive to support places that are affordable by local standards. This is something that’s incredibly important to me. 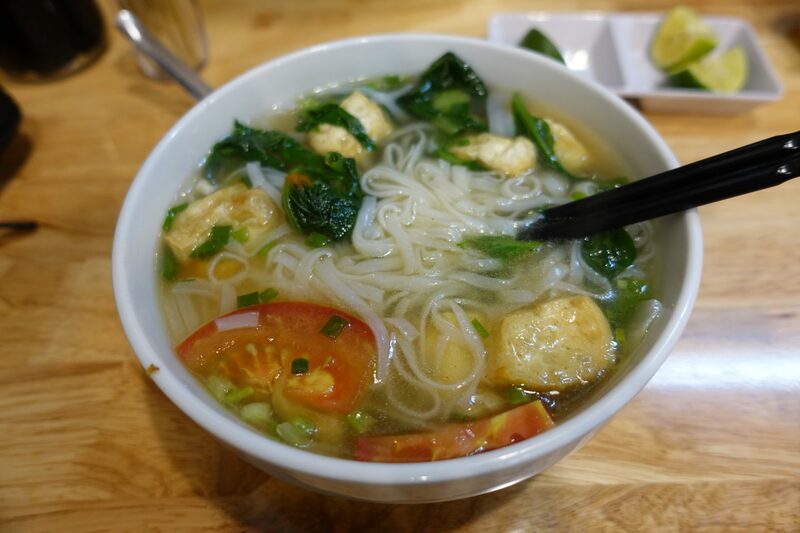 In this post, I am going to share with you my favorite places for affordable and delicious vegan food in Hanoi. This is one of my favorite places to grab vegan food in Hanoi. Vegan Banh mi is a small family-run 100% vegan street food vendor. 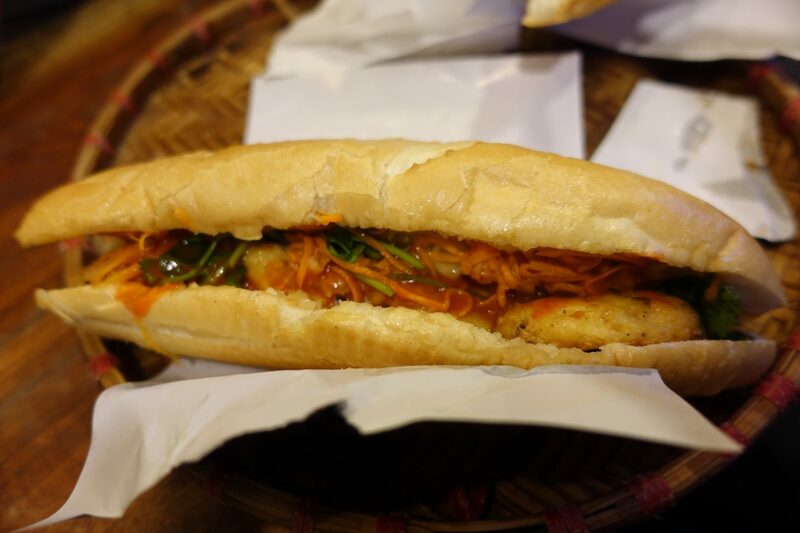 They have a vegan Banh mi for 20,000 VND and desserts for around 10,000 VND among other dishes. I went there on a regular basis and loved everything I tried. Unfortunately, on the very last day, I visited they changed the recipe and it’s now an entirely different Banh Mi. Make sure to check out my post about it here. The most delicious Banh mi ever! Com Chay Tu Hao is lunch spot with a huge all you can eat buffet for 35,000 VND. The buffet offers heaps of (steamed) vegetables, tofu, and various other dishes. They also always have lichies and pineapple and each meal comes with soup. I absolutely loved it! This is definitely a local spot – whenever we went the small restaurant was packed with locals. This is probably the most popular Banh mi stall in Hanoi. Every time I went there was a huge line of tourists. Their tofu Banh costs 25,000 VND and iss filled with heaps of tofu and incredibly filling. While I usually need two Banh Mi’s to fill me up from Vegan Banh mi, at Banh mi 25 just one does the trick. I wanted to give it a try because people on TripAdvisor are raving about it! I’ve had it a lot and it has definitely grown on me. Edit: I am not 100% sure if the batter of the tofu was indeed vegan, so make sure to tell them that you don’t consume any animal products. 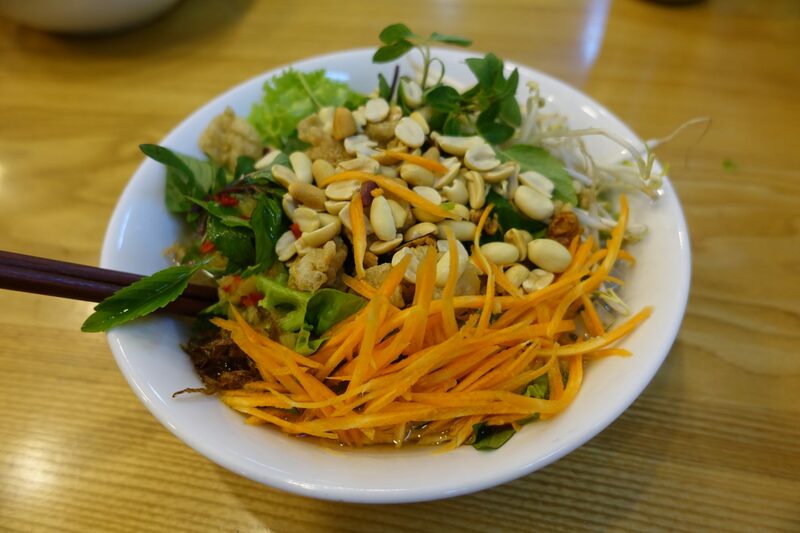 Loving Hut is an international chain of vegan restaurants and there are several of them in Hanoi. The menu of each Loving Hut is different and the food is usually affordable. We went ahead and ordered two noodle dishes, Bun thron thap cam and Bun thang for 40,000 VND each. The portions were really big and it was incredibly filling. 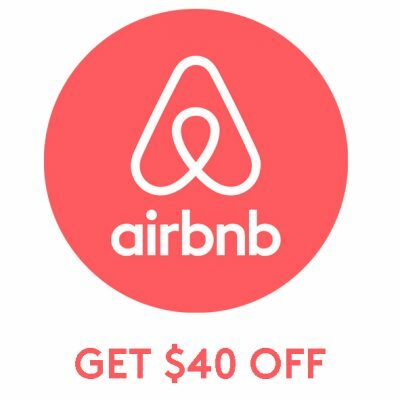 I highly recommend checking it out! V-Cuisine is a small restaurant in the backpacker district that has two pages of vegetarian options. From what I could see a lot of them were or could be made vegan. Most mains are around 40,000 VND which is reasonable considering that most spots offering vegan food in this area are really expensive. Although the food is a bit westernized, I really enjoyed it. If you are in the area and in need of affordable vegan food then I’d definitely stop by. My man had the “Rice noodle and tofu mixed with sauce” and also really enjoyed it. 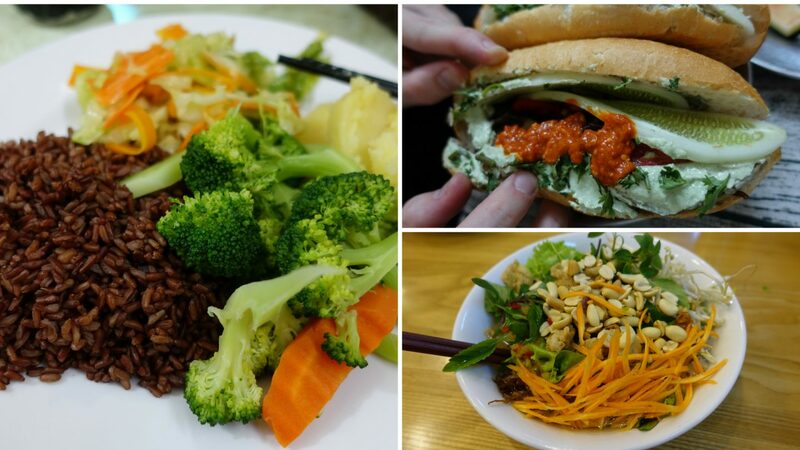 This was it for my favorite places to grab vegan food in Hanoi. 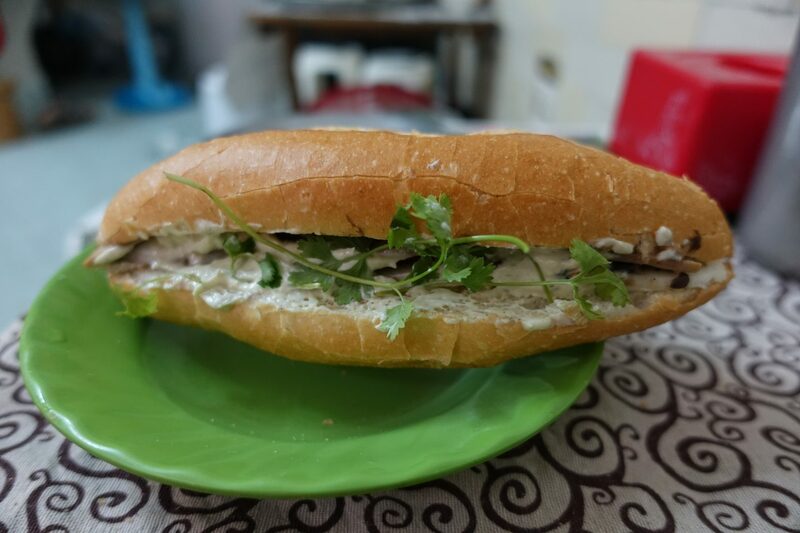 If you are only in Hanoi for a day or two then I highly recommend checking out Vegan Banh mi, it’s hands down my favorite spot in Hanoi. Vegan Banh mi, the Banh mi place I mentioned earlier in this post, has amazing desserts. 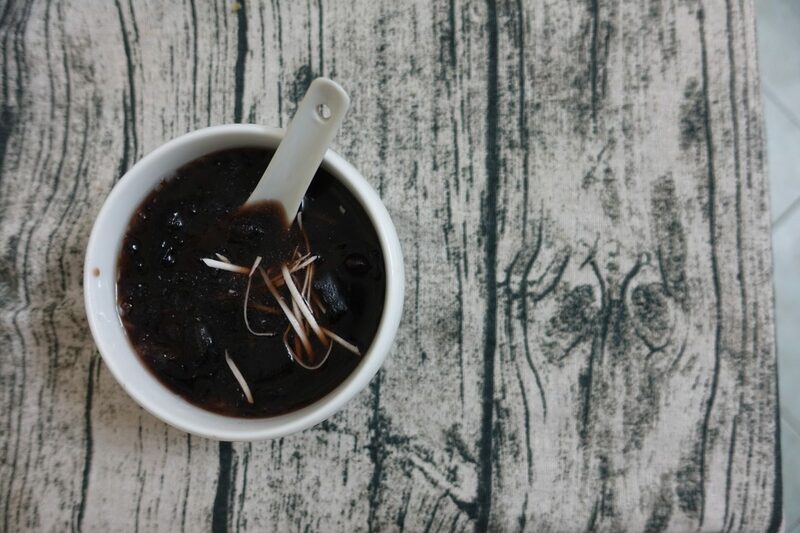 Chè is Vietnamese and simply refers sweet beverage, soup or pudding. There are heaps of varieties and they have several ones for 10,000 to 15,000 VND. Gia Trinh is a small bakery that focuses on traditional Vietnamese cakes. They have a whole bunch of them and some of them are vegan. Most of the vegan ones are around 4,500 VND. My favorites are the coconut cake, green tea cake and one that I don’t remember the name of, it’s dark red and super tasty! 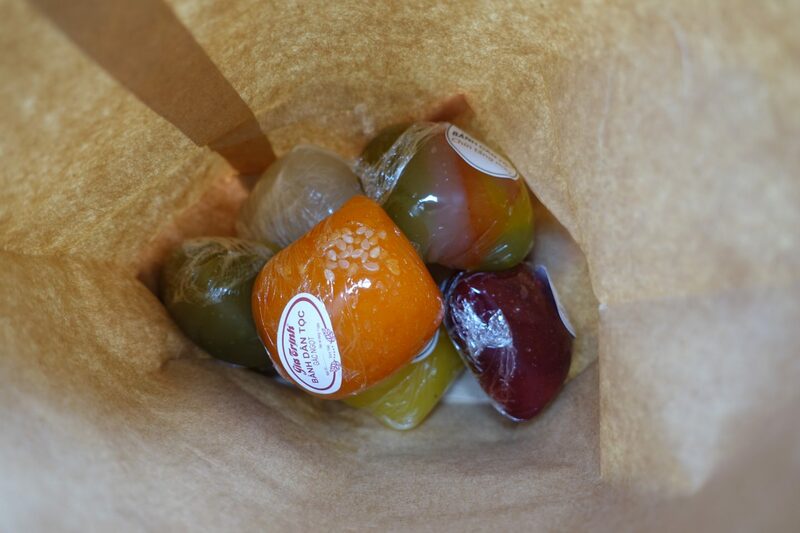 A bag full of Vietnamese cake! 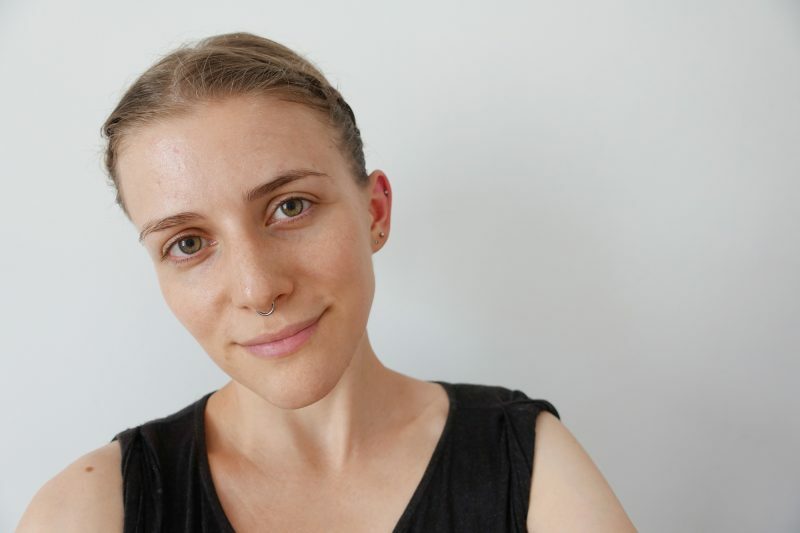 This was my post about affordable vegan food in Hanoi. These are the spots that I frequently visited and Banh mi 25 definitely became a favorite.